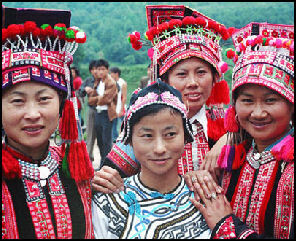 The Yi are one the largest minority groups in China and the largest group on southwest China. They are uplands farmers and herders who live mostly in Sichuan and Yunnan provinces in the areas of the Greater and Lesser Liangshan mountain ranges at elevations of between 2000 meters and 3500 meters. They are particularly associated with the Hong River and Xiaoliang Mountains in Yunnan and the Daliang Mountains in Sichuan. Farming is the main occupation of the Yi. In some places Yi are engaged in raising animals. Main crops are corn, buckwheat, potato, wheat and rice. Also known as the Axi, Lolo, Loulou, Misaba, Nosu and Sani, the Yi are widely scattered and divided into many branches. They have called themselves by many different names such as "Nousu", "Nasu", "Niesu", "Axi" and "Sani". Some branches such as the Sani view themselves as distinct ethnic groups. After Communist China was founded in 1949, the various Yi groups were united under the name "Yi". Good Websites and Sources: Yi Peoples.org (Christian site) yi.peoples.org ; Giant Banjos yizuren.com ; Yi Dance video YouTube ; Yi Wedding China Vista Magpie Dress on China Vista China Vista Yi Photos kwongyuen.net Performance danwei.org . Sources on Individual on Ethnic Minorities in China: (click the ethnic group you want) Ethnic China (very good site with good academic articles) ethnic-china.com ; Cultural China (site with nice photos) cultural-china.com ; China Travel chinatravel.com ; Wikipedia List of Ethnic Minorities in China Wikipedia ; Travel China Guide travelchinaguide.com ; China.org (government source) china.org.cn ; OMF international (a Christian group) omf.org ; People’s Daily (government source) peopledaily.com.cn ; Ethnic Publishing House (government source)e56.com.cn ; Paul Noll site` paulnoll.com ; China Highlights (on some groups) China Highlights . Sources on Ethnic Minorities in China: Book on Chinese Minorities stanford.edu ; Chinese Government Law on Minorities china.org.cn ; Minority Rights minorityrights.org ; Minority Travel: China Trekking (click under Minority Towns) China Trekking ; Wikipedia article Wikipedia ; New York Times Interactive Map nytimes.com ; Ethnic Groups in China (Chinese government site) chinaethnicgroups.com . Links in this Website: MINORITIES IN CHINA--- Factsanddetails.com/China ; MINORITIES IN SOUTHERN CHINA--- HISTORY, RELIGION Factsanddetails.com/China ; MINORITIES IN SOUTHERN CHINA---LIFE AND CULTURE Factsanddetails.com/China ; MINORITIES IN SOUTHERN CHINA---AGRICULTURE, GOVERNMENT Factsanddetails.com/China ; BAI MINORITY Factsanddetails.com/China ; MOSOU MINORITY Factsanddetails.com/China ; NAXI MINORITY Factsanddetails.com/China ; QIANG MINORITY Factsanddetails.com/China . The Yi have a long history. They share a common ancestry with the Bai, Naxi, Lahu and Lisu and appeared around present-day Kunming around the 2nd century B.C. 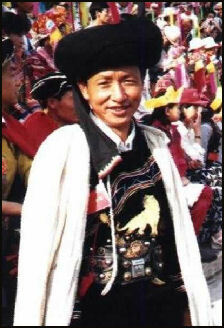 In the A.D. 8th century, the ancestor of the Yi and Bai ethnic groups founded the Kingdom of Nanzhao in Yunnan Province. The Yi have traditionally occupied important trade routes used to carry tea and gems northward from Yunnan and Southeast Asia and horses and knives southward from northern China and Central Asia. They have had a lot of contact with groups in their region the Miao, Lisu, Hui, Hani, Dai and Zhuang---and the Han Chinese. The Yi once evoked fear over much of southwest China. In 1874, a Hui Muslim named Du Wenxiu united the Bai, Naxi, Yi and Dai in a rebellion against the Qing dynasty. The rebellion was brutally put down in 1892. Missionaries arrived when the Burma Road was constructed nearby in 1937-38. The Yi kept slaves until the late 1950s. There were two kinds of slaves---those that lived in the house and those that lived outside. Being an outside slave was preferable to being an inside one. Many of the slaves were captured Han Chinese. 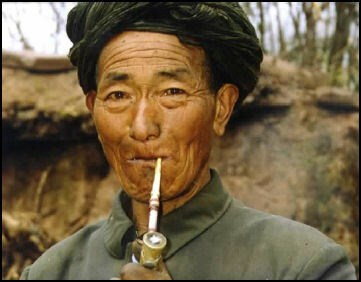 The Yi were also heavily involved for a while in the opium trade. The Yi speak a Tibetan-Burman language, divided into six major dialects, and have a very old, a syllabic script, developed in the 13th century or earlier. Many villages have a shaman or chief that keeps a scroll of pictograms that tell the story of where the Yi came from but otherwise few Yi know this written form The Chinese government helped them standardize their written language into Chinese characters.. The have traditionally honored a pantheon of spirits and gods---including ones representing animals, plants, the sun, the moon and the stars---and incorporated elements of Buddhism and Taoism into their spiritual belief system. Sacrifices have been made to ancestors and ghost have been placated. According to the Yi creation myth: “In the beginning there was only women.” Protestant and Catholic missionaries had some success converted the Yi in the early 20th century and some of these communities remain alive today. 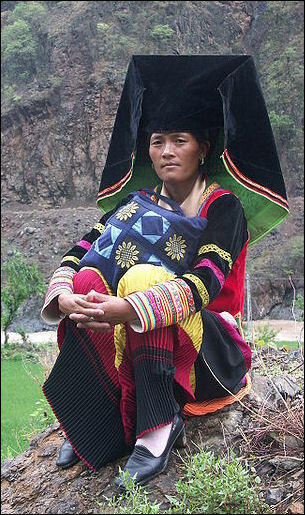 Yi shaman are known as bimo. Highly respected, they carry out sacrifices and perform healing rituals with incense and bowls of chicken blood. Headmen are responsible for controlling ghosts with magic. Often bimo were the only ones who could read the sacred texts that included clan histories, myths and literature.The chicken is an important totemic animal to the Yi. It is honored in a special dance performed at night by dozens of people wearing hats with strung beads arranged in the shape of chicken combs. To the accompaniment of a moon guitars, the dancers execute fast tempo steps from the knee down that mimic the movements of a chicken. According to the Chinese government: The Yis in Yunnan, Guizhou and Guangxi believed in polytheism before liberation 1949, combining worship for ancestors with the influence of Taoism and Buddhism. The Yis in the Liangshan Mountains worshipped gods and ghosts and believed in idolatry, and offered sacrifices to forefathers frequently. Their religious activities were presided over by sorcerers. Festival clothes The Yi have their own calendar---comprised of ten 36-day months---with a year that is divided into two halves, each ending with a solstice. The Yi celebrate two new years---one in the summer and one in the winter. An additional five days are tacked on to each year for festivals. The Yi calendar is believed to be the oldest continually used calender in the world. It was developed around 1500 B.C. by an astronomer named Shidi Tianzi according to observations made of seasons and the sun with a vertical pole called a gnomon. The months and the days were named after animals like the barking deer, blue sheep and leopard. By the A.D. 5th century the calendar was widely used across China and remained widely used in southern China until fairly recently. The Winter New Year Festival (Kushi) is held around December 25th and the Summer New Year Festival (Zhair) is held in late July or early August. The latter features singing, dancing, harvest rites performances with musical instruments, ox fighting, wrestling contests, archery, and processions with torches lit from a central bonfire. The Guanyin Fair is a traditional festival celebrated on the 5th to 20th day of the 3rd lunar month in late March or April at Taoist temples all over China that honors Guanyin (the Goddess of Mercy). The festival is a particularly big event in the Yunnan Province, where the Bai, Yi and Naxi people commemorate the arrival of Guanyin on Mount Cangshan and her victory of over the evil King Luocha. This fair attracts people from all over Yunnan. 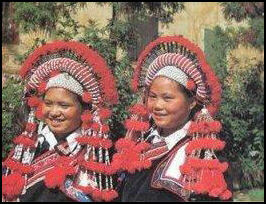 The Bai, Yi and Naxi people dress up in their beautiful ethnic costumes. The Torch Festival is celebrated on the 24th day of 6th lunar month in July or August in southwest China by the Bai, Naxi and Yi people. 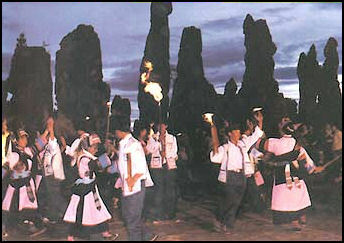 Participants light torches in front of their houses and set 35-foot-high torches---made from pine and cypress timbers stuffed with smaller branches---in their village squares. The Bulang, Wa, Lisu, Lahu, Hani and Jinuo minorities hold similar festivals but on different dates. The festival honors a woman who leaped into a fire rather make love with a king. Before the village torch is lit people gather around it and drink rice wine. The village elders use a ladder to climb to the top of the torch as they distribute fruit and food to the villagers while they boisterously sing the "Torch Festival Song." The torch is then solemnly lit. The villagers light their torches off the village torch and sing and dance and eventually make their ways to their homes and light the torches there. Text Sources: 1) Encyclopedia of World Cultures: Russia and Eurasia/ China , edited by Paul Friedrich and Norma Diamond (C.K. Hall & Company; 2) Liu Jun, Museum of Nationalities, Central University for Nationalities, Science of China, China virtual museums, Computer Network Information Center of Chinese Academy of Sciences, kepu.net.cn ~; 3) Ethnic China ethnic-china.com \*\; 4) Chinatravel.com chinatravel.com \=/; 5) China.org, the Chinese government news site china.org *|* New York Times, Washington Post, Los Angeles Times, Times of London, Lonely Planet Guides, Library of Congress, Chinese government, Compton’s Encyclopedia, The Guardian, National Geographic, Smithsonian magazine, The New Yorker, Time, Newsweek, Reuters, AP, AFP, Wall Street Journal, The Atlantic Monthly, The Economist, Foreign Policy, Wikipedia, BBC, CNN, and various books, websites and other publications.